American jazz has often been described as an accumulation of cultural memory—music that survives by staying in touch with its own history. But the music of Shabaka Hutchings, the 33-year-old saxophonist and bandleader of London’s Sons of Kemet, insists that memory isn’t enough. Hutchings is a fixture in many projects, including cosmic jazz trio the Comet Is Coming, Afrofuturist outfit the Ancestors, and occasionally as a guest player with the Sun Ra Arkestra. His work with Sons of Kemet is notable for its fervent politics and open-borders approach to genre. On the group’s third LP, Your Queen Is a Reptile, Hutchings merges his classical clarinet and jazz orchestra training with the music he’s heard growing up in the Caribbean, traveling in South Africa, and living in London. “That’s an aspect of being a part of a musical diaspora,” Hutchings says in the press materials for Your Queen. “Not being from the place that jazz is born from means that I don’t feel any ultimate reverence to it. It’s just about finding ways of reinterpreting how we’re thinking about the music.” For Hutchings, jazz’s cultural memory is not just something to recite, but a rich language that informs an entirely new conversation. On Your Queen Is a Reptile, that conversation covers a lot of ground with a limited vocabulary. Rendered only with tuba, saxophone, drums, and voice, Hutchings’ compositions are diverse and rhythmically ambitious. He’s not only leveraging jazz, but a broader sonic lexicon including Afrobeat, dub, Caribbean soca, and grime. Your Queen is thematically aspirational as well—as the group’s first LP since the 2016 Brexit vote, it directly challenges the conventions of nationalism and the British monarchy. In their place, Hutchings offers his own version of a royal family, comprising visionary black women like Yaa Asantewaa, the Ashanti queen mother who fought against British colonialism in the early 20th century; the longtime radical activist Angela Davis; and Hutchings’ own great-grandmother, Ada Eastman. Hutchings’ coronation of these remarkable women is a celebratory act, but he’s also commenting on the arbitrariness of all inherited hierarchies. Royalty is a dangerous ideology, and Hutchings counters it with a high court of trailblazing women whose achievements, rather than their bloodline, inform their worth. “My Queen Is Albertina Sisulu,” an homage to a noted South African nurse and anti-apartheid activist, is an Afrobeat shimmy that suggests furious dancing. Cross’ tuba and Hutchings’ tenor tangle phrases, while drummers Sebastian Rochford and Moses Boyd provoke them with anxious raps on rims, hi-hats, and djembe. Hutchings plays in sweetly curving licks before fracturing into staccato blurts. His instrument often reaches manic, searching measures, bringing to mind something saxophonist Evan Parker once told him. “He said: ‘You need to play as if it’s your last chance to play,’” Hutchings recently told The Wire. Hutchings has said he wrote lead single and album highlight “My Queen Is Harriet Tubman” as an interpretation of Tubman’s initial escape from slavery. The effect is urgent—the drummers mimic the pace and posture of someone running for their life, at times slipping and hitting a cowbell or snare with added force, but never losing speed. Saxophone and tuba reach bumblebee frenzy, sputtering by the end of their turbulent flight. It is an exhilarating and highly original piece of music that showcases Hutchings’ ability to translate politics to melody. 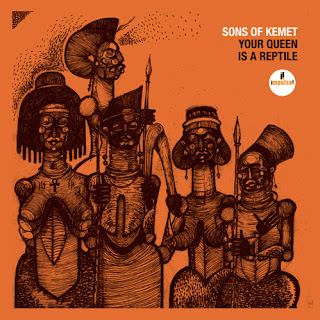 Sons of Kemet are most effective when they transpose concept to instrument this way. But despite the group’s skill for conversing between genres and generations, words are Your Queen’s greatest weakness. Guest vocalist Joshua Idehen delivers his poems with a bravado that at times distracts from Hutchings’ nuanced compositions. On “My Queen Is Ada Eastman,” Idehen’s vocals don’t arrive until minute three, and when they do they dampen the song’s energy. His diction can be a bit goofy, and lines about London winds that “shiver my thin moustache” don’t necessarily help. The poet redeems himself, however, with a simple phrase that seems to speak to the resilient immigrant experience in post-Brexit Britain: “I’m still here,” he repeats. 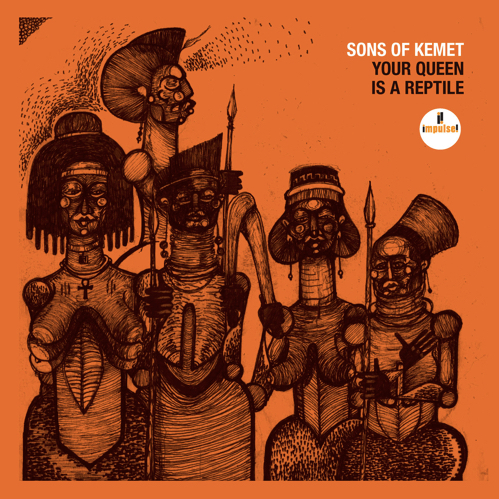 Your Queen is Sons of Kemet’s first release on Impulse!, the label that was home to Charles Mingus, John Coltrane, and Pharoah Sanders at their peaks. This adds another dimension to Hutchings’ relationship with American jazz, placing him among the players whose work he’s trying so hard to subvert and deconstruct. It is a peculiar achievement for him in some ways, but it is also a testament to his talents as a composer and player. Hutchings may not feel any “ultimate reverence” to the genre, but its tastemakers see a lot of promise in him. Given the passion and innovation he’s breathing into contemporary jazz, why shouldn’t they?